Most Tamil political parties in Sri Lanka could become things of the past if the Supreme Court acts on a petition that seeks disqualification of the parties for retaining the demand for a separate state in their party documents, called constitutions. Long after the Tamil political parties dropped their demand for a separate state, their unamended party constitutions, in which the demand for a Tamil Eelam are stated, have come to haunt them. The Sixth Amendment to the Constitution, enacted in August 1983, prohibits political parties from having as one of their aims the establishment of a separate State. The petition was recently filed in the Supreme Court by a little-known advocate who is part of an unrecognised political party — Jayantha Liyanage, general secretary of Sinhala Jathika Peramuna based in Kurunegala. The targets are: the Tamil National Alliance (TNA); the Ilankai Tamil Arasu Katchi (ITAK); the Tamil United Liberation Front (TULF); the Tamil Eelam Liberation Organisation (TELO) and the Eelam People’s Revolutionary Liberation Front (EPRLF). The petitioner’s plea to the court is to declare that the parties in question have the formation of an independent state as one of its aims. The petitioner has meticulously adhered to all the provisions mentioned in the Constitution and the application has faultless English. Article 157A (4) states: “Where any political party or other association or organisation has as one of its aims or objects the establishment of a separate State within the territory of Sri Lanka, any person many make an application to the Supreme Court for a declaration that such political party or other association or organisation has as one of its aims and objects the establishment of a separate State within the territory of Sri Lanka. Article 157A (5) (b) also prescribes punishment for anyone associated with such organisations. This includes “civic disability for such period not exceeding seven years”, forfeiture of movable and immovable property minus, what the Court determines, is required for the individual’s sustenance, losing civil rights for a maximum period of seven years, and losing membership of Parliament, if the person is an MP. TULF, TELO, EPRLF and the All Ceylon Tamil Congress were once part of the Tamil National Alliance — the only credible representative of the Tamil people of the north. TULF and the ACTC left the alliance later. The ITAK has among its goals “establishing of a unitary Tamil State and a unitary Muslim State and achieving political, economical and cultural freedom of the Tamil speaking community”, as its aim. The TULF, in its ‘Vaddukodai resolution’ on May 14, 1976, had resolved that the “restoration and reconstitution of the free, sovereign, secular socialist State of Tamil Eelam, based on the right of self determination inherent to every nation has become inevitable in order to safeguard the very existence of Tamil nation”. In its election manifesto in 1977, the TULF, while outlining the many issues that made it work towards a separate state, says that the TULF “seeks in the general election the mandate of the Tamils to establish an independent, sovereign, secular, socialist State of Tamil Eelam, that includes all the geographically contiguous areas that have been traditional homeland of the Tamil speaking people in the country”. Apart from targeting individual parties, the petitioner has also gone after the TNA. He says that the TNA has been negotiating on the basis of the ‘Thimpu principles’, (based on the 1985 Thimpu declaration). Tamil parties declared that Tamils in Ceylon should be recognised as a nation, their identified homeland should be recognised, and their right to self determination should be recognised. “The TULF and the TNA never revoked or amended individually or collectively the said ‘Thimpu principles’, which contains all the political ingredients to establish a ‘sovereign Tamils state’ in the areas of the North and Eastern Provinces of Sri Lanka,” the petitioner said. The petition was classified under “miscellaneous” section in the list on April 27, 2012, and did not receive much attention from even lawyers in the Court. But the Tamil political parties seem to have noticed. A few days ago, a prominent Tamil National Alliance leader announced in Jaffna that creation of Tamil Eelam was not the demand of the umbrella alliance of Tamil parties. This “amendment” was brought a month after July Riots in 1983, is the timing a coincidence?And the party that filed the case itself has “sinhala” integrated in its party name, hypocrites! Didn’t Mr Sumanathiran, an Hon MP of the TNA flayed the Govt recently, for not adhering to the Constitution?. Weren’t most of his fellow TNA MPs, inluding his Leader , hand picked by the LTTE Leader,who didn’t give a crap about the Constitution. Didn’t some of these MPs openly defied the Constitution and enjoyed long breaks overseas ,while accumilating all the perks bestowed on them under the same Constitution. Do Sinhala Lawyers prepare High Court Petitions in faulty English?. Interesting to see how Mr Sumanathiran responds to these charges that he himself is not adhering to the Constitution. Tamils demand decolonisation for what SL did in 1972 and not a separate state. If there is no respect for constitution by all parties, what is the point having it in the statute books. Lets make bonfire of constitution. Why not look to India, is it not that the Indian constitution bans any public speaking or promotion of seperation? I would like some people who know to please comment on the Indian constitution as we now seem to be looking to India. If Srilankan government does not folow its own constitution how can you expect any one else to follow? The Indian Constitution too explicitly states that any political party that propagate separation of any state within India from the Indian Union would be banned. That’s why the DMK dropped its slogan of ” The Dravidian Nation is for Dravidian people” in early 1960. The Supreme court of Sri Lanka should follow the same and ban any political party that mention about separation even in its party constitution or in its campaign propaganda. I can now understand why Sampanthan grabed the lion flag and cried for United Srilanka . 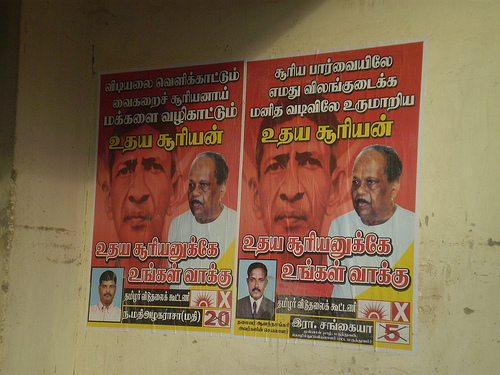 Moves are underway to prevent Tamils from voting for the political party of their choice. Some Tamils are already forced to vote for terrorists like Dougie and Pillayan, now the Supreme Court which is really a rubber stamp for the MR regime will act to distrupt or end the political activities of any Tamil party that does not toe the Southern line. Elections for the Northern and Eastern Provinces will be held with Tamils permenently “disenfranchised”. That pesky problem of Tamils wanting something different from the Sinhales will be solved. It is a good move bythe people who brings this case if it suceeds this will bring Tamils even closer to get Eelam with the help of UN/IC. Sampanthan have grabed the lion flag for many years cos he said that is his goddes pathrakali’s flag. Time to make all political parties just that. Political. No more ethnic, religion or race based parties, period.! The government has to either repeal this amendment or enforce it.Why are they not doing that for decades?Haven’t the sinhalese got a backbone?Either put up or shut up,without disgracing your community.You will be known only as paper lions,instead of growls you let out only a lot of hot air. Either abolish the amendment or enforce it,and if you can’t do both,then kindly delete the lion out of the flag and put a fairy instead. My advice is to abolish it,because it is better to know a known wolf than an unknown one.Better to deal with wolf than a wolf in sheeps clothing.